Sierra Club volunteer Betty Gearen said she was temporarily barred from yesterday's recycling fair because of this sign. 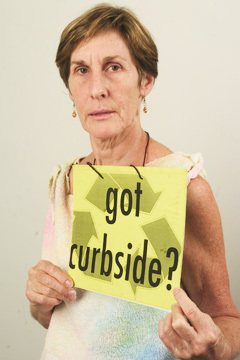 A Sierra Club volunteer wearing a "Got curbside?" sign to protest changes to the city curbside recycling program was initially denied entrance to a city-sponsored recycling fair yesterday. The Discover Recycling Fair continues at Blaisdell Arena from 9 a.m. to 5 p.m. today and 10 a.m. to 3 p.m. tomorrow. Admission is free. Parking in the Blaisdell parking lot costs $4. Betty Gearen eventually wore her sign inside the Blaisdell Arena, where she was helping fair attendees make artwork from recycled goods. But she said even temporary exclusion from the event because of the sign seemed a violation of her right of free speech. She said city workers told her to remove the 8-by-11-inch laminated sign around her neck because it could be a hazard. "I wanted them to know, if I was going to work there, that I wasn't supporting the mayor's decision to pull the plug on curbside recycling," Gearen said. "It seemed they were trying to take away a statement on my body. It wasn't pornographic. It just said I want curbside." Mayor Mufi Hannemann announced Oct. 18 that the city was putting on hold indefinitely plans for an islandwide curbside recycling service. He cited legal disputes among bidders for the private contract to process aluminum, glass, plastic and newspaper collected by city refuse crews, and said the process was taking too long. Gearen said she gathered 514 signatures yesterday urging the city to proceed with a curbside recycling plan as soon as possible, and passed out 200 smaller, wearable versions of her "Got curbside?" message. City spokesman Bill Brennan said he saw some people wearing the smaller signs when he was at the event with Hannemann yesterday. He said he was "not aware of it (Gearen's exclusion) firsthand." Gearen's ordeal at the fair shortly before noon was captured by some television news stations. It wasn't the only sign of friction at the free educational event, which continues today and tomorrow. Musician Jack Johnson, who is known for supporting environmental education in schools through his Kokua Hawaii Foundation, originally had been scheduled to perform at the fair yesterday, but did not. Brennan said Johnson canceled his gig after Hannemann canceled curbside recycling. Sierra Club Executive Director Jeff Mikulina and Gearen said they were told by Johnson and his wife, Kim, that he was still willing to play at the fair, even though he was disappointed in the city's decision not to pursue curbside recycling immediately. They said Johnson decided not to play only after being questioned by city officials yesterday as to whether he supported the petition drive urging the city to keep working on a curbside recycling program. Johnson couldn't be reached for comment yesterday. He wrote in an Oct. 25 letter to the Honolulu Advertiser that he would honor his commitment to play at the recycling fair, but urged the city to keep searching for a way to make curbside recycling work. The Discover Recycling Fair aims to educate the public about recycling options on Oahu, said Suzanne Jones, the city's recycling coordinator. In addition to booths from Oahu recycling companies, there is a recycling learning center, a recycled art workshop and information about fund-raising for schools and nonprofits through the state's HI-5 container deposit program. More than 2,000 students attended the fair yesterday on field trips, and more are expected today, Jones said.